Goldenvoice has announced the line-up for April’s Coachella Valley Music and Arts Festival 2019. 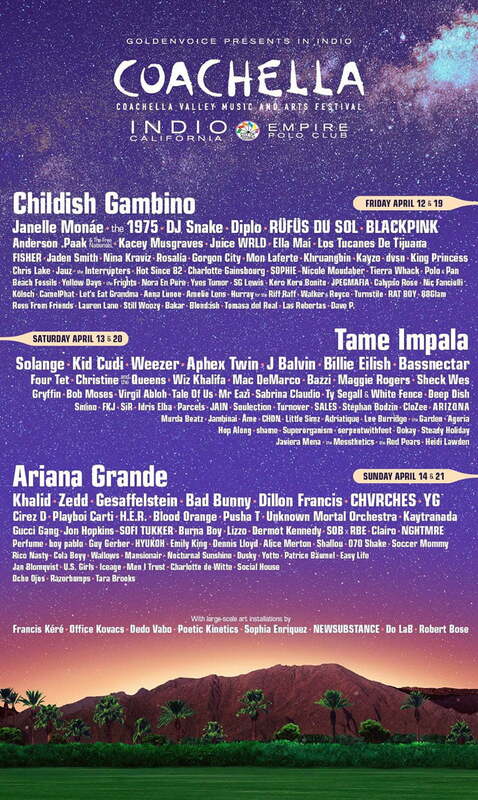 Childish Gambino, Tame Impala and Ariana Grande will headline both weekends of the 125,000-capacity mega-festival, which returns to the Empire Polo Club in Indio, California, on 12–14 April and 19–21 April. Other notable performers include Janelle Monáe (pictured), the 1975, Khalid, Diplo, Weezer, Aphex Twin, Zed, Billie Eilish, Bassnectar and Christine and the Queens. According to US gossip site TMZ (so take with a hefty pinch of salt), Kanye West pulled out at the last minute after a dispute over the size of the festival’s stages. “It’s not the boomers’ Coachella anymore, nor the Gen-Xers,” he adds. Coachella 2019 tickets are on sale tomorrow (Friday 4 January) from Coachella.com, with single-weekend general admission passes starting at US$429.